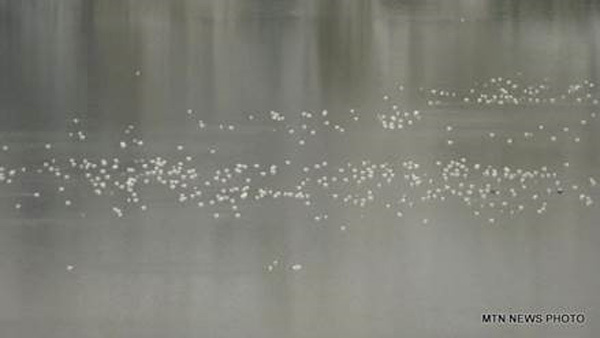 In November of 1995, a large flock of migrating snow geese, heading south for the winter, took refuge from a snowstorm and landed on the unfrozen surface of an open pit copper mine on the outskirts of Butte, Montana. The old mine, called the Berkeley Pit, had been inactive for decades, but it was full of dissolved heavy metals and highly acidic water. 342 of the geese died during that event, autopsies showing perforated esophageal ulcerations from drinking the water. Information about heavy metal toxicity is not available. Except for canaries, underground mines have never been a threat to birds, and underground mines were the norm until the 1950s when open pit mining began in Montana. 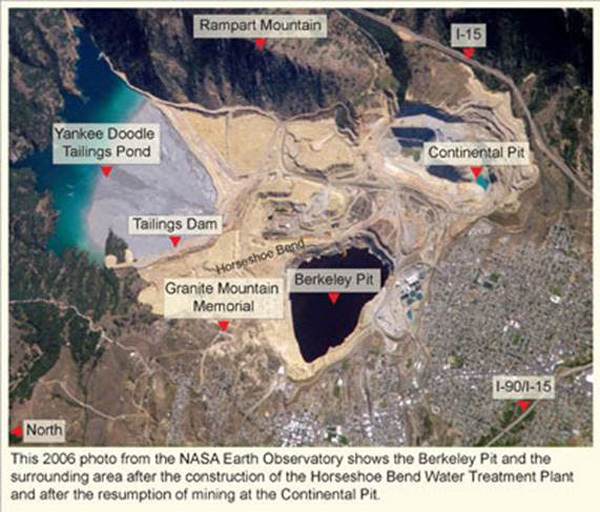 The Berkeley Pit was the first open pit mine in the area and today it is the most toxic open pit copper mine in the world. And it is lethal to water birds. Within days Montana Resources, the mining company responsible for the mine reported that “all the birds were dead.” Some of the geese that had managed to fly away from the lake were found dead or dying in the vicinity. Veterinarians that treated the few birds that didn’t die in the water failed to save any of them. Severe poisoning with heavy metals are essentially incurable and untreatable, even in humans, because those toxins are so rapidly lethal to nerve, liver and kidney cells and so damaging to the body’s mitochondria and the enzyme systems that are so critical to health. Human living in areas where copper and other metals have been mined from sulfide ore may eventually be similarly sickened by the same pollutants. Fortunately most humans will not mistake the polluted water of a mining pit for drinking water and therefore they will probably not be as seriously poisoned as were the snow geese. According to www.pitwatch.org, “Montana, Fish, Wildlife and Parks (FWP) is advising hunters to wait to consume snow geese harvested after November 28 in the Butte and Dillon area. Instead, FWP recommends that hunters process and freeze birds at this time but to not eat them until the department knows how or if this event has affected the edible portions of the birds.” Concerned observers of Butte’s endangered water supplies suspect that a subsurface plume of copper mining toxins is heading for the city’s aquifer. What happened in Butte with the snow geese die-off has some similarities to what used to happen to the caged canaries that miners used to take with them down into the poorly ventilated underground mines where toxic fumes and poorly oxygenated air could be lethal to humans. The canaries were being used as early warning systems. Modern mountain top removal tactics and open pit mining have made both underground mines and canary-type early warning systems obsolete. 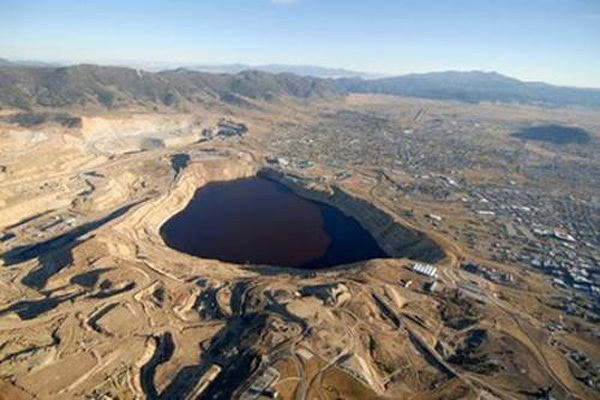 The now-infamous Berkeley Pit of Butte, Montana is a played-out, water-filled open pit copper mine that will be poisonous forever. It is a fact that water that is poisoned with heavy metals in the sludge at the bottom and with dissolved metal ions in the water can never be remediated! The mining company that has assumed responsibility for the Berkeley Pit, Montana Resources, says that they have been remediating the Pit for 20 years. And yet the water remains lethal. 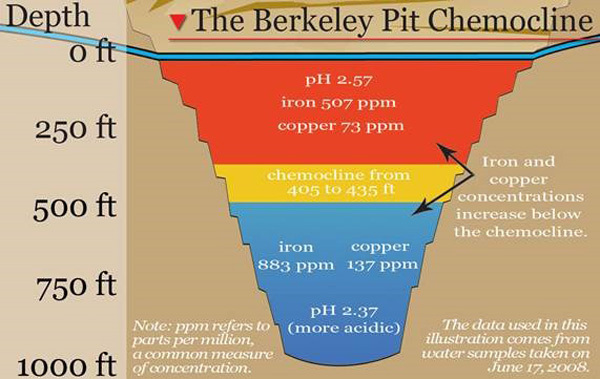 As is true for most copper mines around the world, the Berkeley Pit contains toxic levels of mercury, lead, arsenic, cadmium, copper, zinc and iron. Each dangerous metal ion was once safely in the ground in the form of a relatively inert metal sulfide – until it was ground up and exposed to oxygen and water. Sulfur-containing ore, when exposed to oxygen and water (as in a rainstorm), readily turns into sulfuric acid (H2SO4). Clean-up responsibility for the massive pollution problem in Butte has been assumed by the EPA as a Superfund site, which is not fully funded by the under-regulated mining companies that created the problem in the first place. Remediation costs are so astronomical that mining companies could never be expected to voluntarily set aside large enough escrow accounts to pay for real clean-up. With all the sulfuric acid being produced, most copper mine effluent has a pH of 2.5 - the acidity of gastric acid! Such acidity is incompatible with aquatic animal or plant life, and it can cause severe mouth and esophageal burns when swallowed. Even more problematic than the acidity is the metallic content of the water, which includes the aforementioned heavy metals such as mercury, lead, arsenic and cadmium. The poisoned water in the Pit is off-limits to humans of course, and any animal that drinks the water will probably die from the exposure. The total absence of plant life noted in the images further below testifies to the toxicity of the water. “The long period of mining in Butte left the landscape littered with un-vegetated or sparsely vegetated mine wastes, often containing hazardous concentrations of metals and arsenic, These wastes represent significant sources of environmental contamination to Silver Bow Creek and posed human health and risks to the environment. What makes the tailings ponds so dangerous is the fact that the copper extraction process requires that the ore be ground up into a fine powder to which is added water and chemicals, and then, after the copper has been extracted, the semiliquid slurry containing a multitude of dangerous chemicals and metals is pumped through a pipeline to a waste pond. Copper mine tailings ponds are encircled by soft, sometimes disturbingly soluble earthen dams that are supposed to contain the liquid slurry forever. These dams contain millions of gallons of mine waste that has the consistency of slime. Each pond is an environmental disaster waiting to happen. If a dam rupture does happen, there will be irremediable consequences for everything downstream, because the toxic waste contains millions of cubic yards of unknown chemicals, toxic metals and sulfuric acid. The soil and ground water that underlies the ponds are automatically contaminated. The same is true of the surrounding rivers, streams and lakes that are in the vicinity. Very little can be done to prevent such contamination, but it is important to point out that the toxicity of the slurry ponds is far worse than the toxicity of the water in an open mine pit, although both will be poisonous forever. A typical example of a copper mine mega-flood happened on August 4, 2014 at Mount Polley’s tailings pond in British Columbia. It was called the worst environmental disaster in Canadian history. As far as I was able to ascertain, the disaster was never reported in the media of my region of northern Minnesota. The water-soaked earthen dam broke and poured millions of gallons of toxic waste directly into the previously pristine Quesnal Lake and soon thereafter into the Fraser River that flows to the Pacific Ocean (see aerial video footage of the disaster at: http://www.theglobeandmail.com/news/british-columbia/bc-mines-inspector-makes-19-recommendations-over-collapse-of-tailings-pond/article27818772/). The two Penny Stock mining companies (PolyMet and Twin Metals) that are making so much noise about wanting to mine low grade copper ore and precious metals in northern Minnesota will need to construct large tailings ponds, utilizing earthen dams. One of these dams will be located near the pristine Boundary Waters Canoe Area that flows north, and the other will be at the headwaters of the St. Louis River, which flows south into the western tip of Lake Superior. If such tailings ponds suddenly break during a torrential or a prolonged rain event, catastrophic flooding could occur, permanently polluting everything downstream with the tailings toxins, with serious consequences for children and other living things downstream including fish, fowl and wild rice beds. In the mainstream media, mining disaster stories are rarely covered in the media. If they are dealt with at all, they are not covered in any meaningful way. It doesn’t take a rocket scientist to answer the question “why aren’t they covered?” One only has to take note of the fact that big polluting corporations shell out serious advertising money with the expectation that the publishers and editors will be giving them favorable coverage – or else. Simultaneously, the absence of hard-hitting journalism will create readers that will eventually come to believe that even obviously amoral or even cunning and criminal corporations are actually good citizens because they sponsoring our favorite TV shows and sports events. The tactic is called “green-washing”. I hope that all politicians, journalists and investors who are capable of unbiased critical thinking will do the right thing and listen to reason when they hear the pro-sulfide mining hype that is coming from the two Canadian Penny Stock Junior mining companies (PolyMet and Twin Metals). Despite never having done any mining before, they are both being allowed to fast-track the approval process to start mining copper (and building tailings ponds) in northern Minnesota. Both of these paper companies are obviously “wagging the dog”, with shady deals with large foreign multinational corporations waiting in the wings to buy the companies and take over the mines. Montana Resources is the mining company that currently operates an open pit mine not far from the Berkeley Pit. It is called the Continental Pit. It continues to pump both tailings and waste water from the pit into the already toxic, benignly-titled, Yankee Doodle Tailings Pond. Lime rock is added regularly to the slurry in the pond in order to artificially create a neutral pH, thus mitigating what is called acid mine drainage. However, the lime does nothing to mitigate the lethality of the heavy metals that will permanently remain both in the toxic sludge at the bottom of the pond and in the water above. One can be certain that, when Montana Resources has finished with the Continental Pit, it will – along with the Berkeley Pit - become just another EPA taxpayer-funded Superfund site. Montana and Butte will be on their own if the Trump administration succeeds in its anti-environmental agenda. Scott Pruitt, climate change denier and Trump’s nominee to head the EPA, will surely cripple many of the EPA’s functions, including the Superfund management duties. (Incidentally, Montana voters voted for Trump by a 56% to 36% margin, but its duped citizens surely did not think that they were voting to make the state unlivable for the children in the vicinity of Montana’s 19 Superfund sites. On that site you will note that Montana has 19 high-priority Superfund pollution sites, Wisconsin has 55 and Minnesota has 46. What Needs to be Done With Corporate Sociopaths? Most corporations, especially the multinational ones, meet the definition of sociopathic personality disorder, and so, given that their purpose is to greedily maximize shareholder value at all costs, they cannot be expected to do anything for the common good. Doing something for the common good is good socialism but bad capitalism. Therefore a different standard needs to be applied to sociopaths. Historically, the executives of for-profit corporations never get punished when they commit crimes – except for the easily affordable “wrist slap” fines that governments occasionally impose - which corporations regard as simply one of the costs of doing business. Sociopathic corporations – just like their human counterparts - tend to be conscienceless predators, exploiters and serial liars. They are fully capable of doing criminal deeds while simultaneously feeling no guilt or remorse for perpetrating them. Human sociopaths are incurable and therefore the dangerous ones need to be removed from civilized society and even locked up. It is my considered opinion that sociopathic corporations that commit homicidal acts, deserve capital punishment for their capital crimes, simply to defend innocent folks trying to live in a civilized society. It is the nature of dog-eat-dog predators in our uber-capitalist society to beat up, exploit and consume their competitors. It seems that they can’t quit unless there is force involved. And that goes for the mining corporations that just killed a large percentage of Canada’s snow geese population. Therefore I call on all people of conscience at all levels of society to become active in protecting the planet from corporate exploiters, predators and destroyers. The snow geese would agree.